A wrapped cone heel gives this streamlined, pointy toe bootie the silhouette of the season. 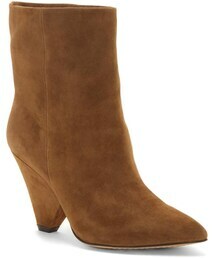 Style Name:Vince Camuto Regina Cone Heel Bootie (Women). Style Number: 5697881_1. Available in stores.